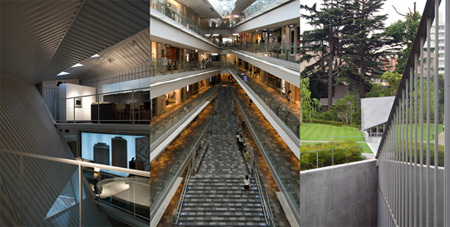 Three recent works of Tadao Ando in Tokyo (pictured above from left to right: hhstyle.com/Casa, Omotesando Hills, 21_21 DESIGN SIGHT). You see a definite departure from earlier works with the incoporation of lots of sharp angles and diagonals. I'm not sure I like this "new" Ando. These are pretty underwhelming projects compared to his earlier work like the Church of the Light and the Modern Art Museum of Fort Worth.